As Congress considers passing the Raise the Wage Act of 2019, which proposes raising the federal minimum wage to $15 per hour by 2024, EPI has created a new interactive map that shows the share and count of workers in each congressional district that would receive wage increases if the bill passes. The map also breaks down the share of workers who will benefit by age, gender, and race. Notes: Map is colored based on the share of the congressional district workforce that would be affected. 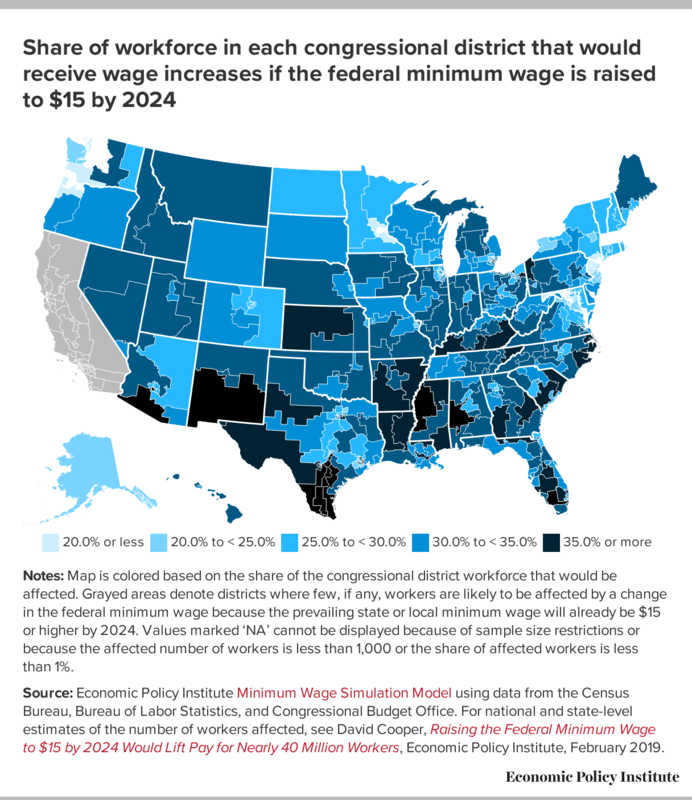 Grayed areas denote districts where few, if any, workers are likely to be affected by a change in the federal minimum wage because the prevailing state or local minimum wage will already be $15 or higher by 2024. Values marked ‘NA’ cannot be displayed because of sample size restrictions or because the affected number of workers is less than 1,000 or the share of affected workers is less than 1%. Map is colored based on the share of the state workforce that would be affected. Grayed areas denote districts where few, if any, workers are likely to be affected by a change in the federal minimum wage because the prevailing state or local minimum wage will already be $15 or higher by 2024. Values marked ‘NA’ cannot be displayed because of sample size restrictions or because the affected number of workers is less than 1,000 or the share of affected workers is less than 1%. Values reflect the result of the proposed change in the federal minimum wage. Wage changes resulting from scheduled state and local minimum wage laws are accounted for in the simulation. Totals may not sum due to rounding. Total estimated workers is estimated from the American Community Survey respondents who were 16 years old or older, employed, but not self-employed, with earnings in the prior year. See the methodology for details. Source: Economic Policy Institute Minimum Wage Simulation Model using data from the Census Bureau, Bureau of Labor Statistics, and Congressional Budget Office. For national and state-level estimates of the number of workers affected, see David Cooper, Raising the Federal Minimum Wage to $15 by 2024 Would Lift Pay for Nearly 40 Million Workers, Economic Policy Institute, February 2019.